Ayman Al-Zawahiri calls on Muslim supporters to band together to confront the “threat” from the West and Russia. Al-Qaeda leader Ayman Al-Zawahiri is calling on Muslim supporters to band together to confront the “threat” from the West and Russia in Syria and Iraq, Reuters reported on Sunday. The call came in the latest recording from the Al-Qaeda leader and, in it, he suggested greater unity between his and Islamic State (ISIS). "The Americans, Russians, Iranians, Alawites, and Hezbollah are coordinating their war against us -- are we not capable of stopping the fighting amongst ourselves so we can direct all our efforts against them?" he said in an audio recording released on the Internet on Sunday, according to Reuters. In September, Zawahiri released a recording in which he said he viewed ISIS’ claim to be a caliphate as “illegitimate” but would join them in fighting Western and secular forces in Iraq and Syria if necessary. 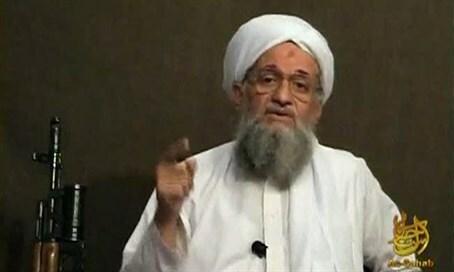 "My mujahideen brothers in all places and of all groups ... we face aggression from America, Europe, and Russia ... so it's up to us to stand together as one from East Turkestan to Morocco," Zawahiri said in Sunday’s recording. Despite fierce fighting in Syria between ISIS and a coalition of powerful jihadist groups which included Al-Qaeda’s Syria affiliate Al-Nusra Front, Al-Nusra and ISIS had temporarily agreed to work together several months ago. However, by June this year that alliance seemed to have ended, when ISIS jihadists beheaded 12 men from rival Syrian rebel movements. Three of those killed in the new video were from Jaysh al-Islam, one of the main rebel groups in the Damascus area, and a fourth from Al-Nusra Front. Zawahiri also released a recording in September in which he called on young Muslim men in the United States and other Western countries to carry out attacks in their countries.